I just had my second pelvic ultrasound, and this time I tried the FETAL BIOMETRY WITH GENDER DETERMINATION IN 3D (FB3D) in In My Womb clinic in SM Megamall. The original price for this ultrasound is P2,200 but they have an ongoing promo until September 30, 2011 which cuts P400.00 from the original price. So I only paid P1,800. My first ultrasound was done on my 25th weeks and the Sonographer was able to determine the gender. But as an excited mom, I still want to make sure the gender of my baby by having a second pelvic ultrasound. The FB3D includes 5 black and white pictures and 5 colored pictures of my baby in 3D. It also includes Diagnostic comprehensive OB-GYNE report and of course Gender Determination which is 99-100% accurate. So hubby and I went to In My Womb clinic at SM Megamall. I am on my 30th weeks already. We went there at around 11am although my appointment time was 4pm. Good thing the patient scheduled for 11am scan was late so I was able to go in first. The OB asked me if the baby was moving or awake. That time, I just had a good lunch and I know that my baby sleeps whenever I’m full. I was not aware that it is best to have an ultrasound when the baby is awake or in high mode. 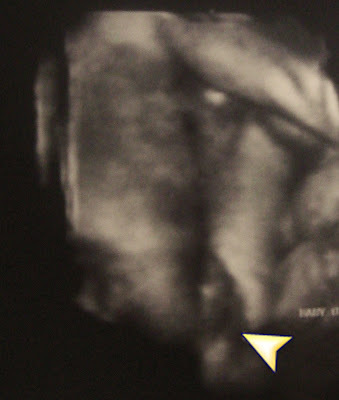 We have seen some images of my baby, like the lower lip, legs and the hand covering the face. The OB tried to push my belly to wake the baby, we even call her name or I was asked to cough just make her move. Hubby tried to call her also because my baby responds the most to hubby’s voice, but he failed. After the efforts, she turned her back so she can show us her growing hairs at the back of her head. But even though my baby did not cooperate well in that scan, I can feel that she doesn’t want us to go home with doubt about her true gender. She was able to show her va-j-j clear enough for us to believe that she is really a girl. So what we only got was the picture of her private partJ. We had another schedule for FREE re-scan next week. And on that day, I will make sure that baby is up and kicking from the inside! Here, I’ll share what my baby showed to us. I’ll make an update for this blog once I got some clearer picture of baby. We are talking to her so she’ll cooperate and show up good pictures for us. It's definitely a Baby GIRL! By the way, the 3D ultrasound was a great experience. It was a combined feeling of excitement and thrill. Seeing your baby in 3D images is priceless! People in In My Womb clinic were so nice and accommodating as well. 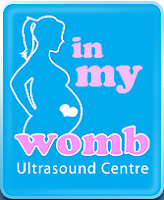 A full service Prenatal Imaging Center specializing in 3D & 4D Ultrasounds for expectant mothers--proudly serving moms of Santa Ana, Anaheim, Long Beach, Downey, Fountain Valley, Costa Mesa, Orange, Garden Grove, Tustin, Huntington Beach, Midway City, Fullerton, Yorba Linda, Brea, Irvine, Placentia, Buena Park, Cypress, Newport Beach, Stanton, La Mirada, Cerritos, Long Beach, Lake Forest and La Habra and open time: M-F 10am-8pm Saturday and Sunday 10am-4pm.